In Gotham City Captain Maggie Sawyer is summoned to a crime scene curious as to why Detective Chang called her in the middle of the night. Chang explains that he didn't want to put the call over the radio and proceeds to show her what appears to be the body of Lex Luthor. Over the skies of Kahndaq Power Girl battles Terra Man. This draws Black Adam's attention and he informs Power Girl that her fight over Kahndaq's airspace is unacceptable adding that trespasses over his homeland will not be tolerated. At the Steelworks in Metropolis John Henry Irons and his niece Natasha argue over her going to summer school to make up for the D she had received in English that year. A phone call from S.T.A.R. Labs interrupts and John's presence is requested to identify a body. Black Adam receives visitors from Intergang who propose an alliance where the organization would use Kahndaq as a bridge between Africa and the Middle East. Adam kills one of the men before telling the other no. After fighting Shockwave on the streets of Metropolis, Booster Gold attends a press conference that Akteon-Holt holds to announce their sponsorship of him. At the party afterwards Mr. Akteon is arrested for securities fraud, an event that Skeets insists wasn't supposed to happen. John Henry Iron's examination of the body found in Gotham City yields interesting results including the fact that the supposed Lex Luthor is wearing colored contacts. 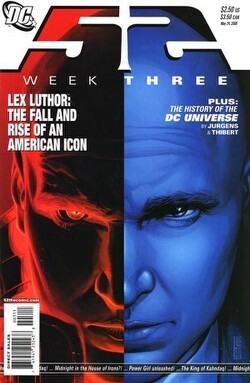 Irons believes that the Luthor on the table is from an alternate reality. The real Lex Luthor disrupts the investigation and holds a press conference to announce that he has been held captive in another reality and that the Lex Luthor lying on the table impersonated him. At the official opening of Kahndaq's new embassy Black Adam announces that his re-dedication to the people of Kahndaq is over and that his new purpose is to gather together allies who will help him change the world instead of merely patrolling it. To illustrate his point he rips Terra-Man into pieces and drops them on the crowd. Donna Troy reviews the history of the DC Universe from the start of Superboy's career on Earth-1 to the Crisis on Infinite Earths. Main Story - 4: I continue to enjoy and be impressed with this series. It is an interesting experiment in comic book storytelling and features characters that may not have had the highest of visibility before but were, on the whole, personal favorites of mine. I love the fact that DC is publishing a series that features Booster Gold, Steel and Black Adam as three of the main characters. The fact that Steel is finally coming back from the depths of horrid characterization makes me very happy. The change in relationship with Natasha is adding a lot of drama to the character and makes from some great reading. This week he was put in a rather sticky position by Lex Luthor and you could see from the expression on his face that John Henry was unhappy about the situation. The discovery of a body that could be Lex Luthor was a great lead-in and definitely grabbed my attention, which I am assuming was the writers' intention. My main question here concerns whether or not the body was that of Alexander Luthor. I'm going to assume a tentative yes and I enjoyed the bit about the contact lenses to explain the discrepancy between the two Luthor's during the lead up to Infinite Crisis. I was also amused by the fact that this was the second time Luthor has used "my doppelganger did it" as an excuse to get out of legal trouble. I guess if it works it works. Booster Gold continues to amuse me. I'm rather fond with the direction the writers have taken the character in. The fact that things keep screwing up is all the more entertaining as Booster is really trying to make a go out of being a corporately sponsored super-hero again. I'm curious as to why the time glitches are happening. Does this have to do with the timeline getting altered by the events of Infinite Crisis or does it have to do with Booster traveling back in time? No matter the reason this particular mystery is one of the reasons this series is working so well and I'm glad it's weekly because frankly I wouldn't want to wait an entire month to find out what happens next. Congratulations, Dan Didio and the rest of the folks at DC. You have succeeded in making the weekly pilgrimage to the comic shop mandatory again. My favorite part of the story, and my favorite character in the series, is Black Adam. Words cannot express how happy I am at how fully developed Black Adam has become over the past few years and while he is extremely violent (which I don't truck with per se but enjoy seeing) the sense of honor he feels in whatever mission he chooses comes through in how Adam is written. His run-in with Power Girl was excellent, especially when he revealed the death toll from Infinite Crisis. I didn't realize someone had been keeping count. The meeting he took with Intergang was fantastic. I think this serves as a lesson; even though Black Adam may seem like a bad guy and while he did hang with the Society for awhile don't come into his home and make an offer involving running illegal operations through his country. It will end badly every time. The change in his mission was rather unexpected as I thought Adam's homeland was more important to him than anything. Maybe by changing the world he is ensuring the safety of his people. The one thing I am certain of is that if you are going to make a point ripping an old Superman villain in half is a pretty effective way to do it. Art - 4: Anytime you have Keith Giffen doing the art breakdowns it is going to look good. While the detail, depth and physical characterization was all Joe Bennett and Ruy Jose there are few artists who have the instinct for page layout that Giffen does. It is rare to see six or more panels to a page, but for this particular story it is almost necessary. It helps keep the pacing that the writers have developed and separates it visually from many of the comics currently being published. Make no mistake, though, Bennett and Jose's pencils and inks are amazing. This is a character based story and their style mesh well with that. The characters and backgrounds have a great deal of detail about them, which looks good and gives the book an almost real world feel. It's not photo-realistic, but at the same time it looks very natural. Backup Story - 3: It's kind of strange. I was really looking forward to this aspect of 52 and so far my feelings are mixed. I applaud Dan Jurgens attempts to make this something more than a simple history tale but at the same time the pacing is sort of confusing. I realize this is only my personal opinion, but I would have liked something a little more linear. Art - 4: While I wasn't all that hot on the way the story was told I really dug the way it looked. Excellent job. I've always been a big fan of Jurgens as an artist and watching him draw practically the entire DCU is a just great. Cover Art - 5: The covers to this series have been a real treat and this issue's was no exception. The two-tone coloring made for a striking piece of art that would, in my opinion, grab the potential reader's attention. The news ticker type effect at the bottom of the cover was interesting. It not only allowed the reader a preview of what was going to happen over the course of the story but it also added to the special nature of this series. Between the website that is updated frequently and the ticker I get the sense as a reader that this series is a big deal. Jones' art is fantastic and I look forward his work in the weeks and months to come. Check out the Comic Index Lists for the complete list of Superman-related comics published in 2006.